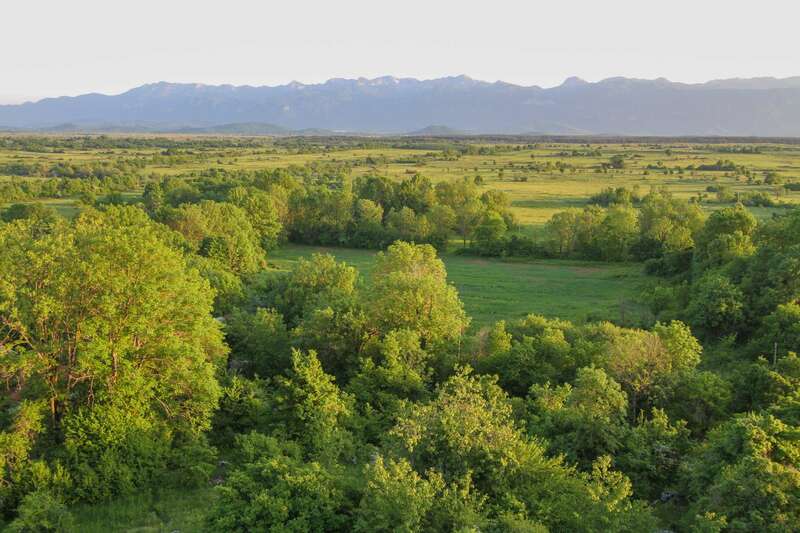 Against the backdrop of the Velebit Mountains in Croatia, one of the most beautiful plains of Europe can be found: the flood plains of the Lika river. More than 30,000 ha of open grassland areas, the natural habitat of massive herds of large herbivores. Driving on the highway from Zagreb to Split you have a good view over this impressive landscape, but until recently you would have missed the grazing herds. Land abandonment, accelerated by the recent war, has left a desolate landscape where shrubs, young trees and bracken take over the wealth of flowers and butterflies that once covered these plains. But this situation will soon change. For Rewilding Europe this is one of the hotspots to show how the comeback of natural processes shape the conditions for the sustainable development of Europe’s richest ecosystems. Natural river dynamics in combination with spontaneous recovery of forests, influenced by herbivory and carnivory are the key underlying processes. Together with local landowners and -users, and many others, we are step-by-step enlarging the area where these natural processes take over. By bringing back herds of horses, tauros and (in the mountains) red deer, not only the natural impact of herbivory is restored, but also the food chain of which in the end wolves, bears and lynxes – that still live in the area – can build viable populations. Vultures, now largely missing in the Velebit area, can return as a result of this wildlife comeback. By the rewilding of suitable horses and bovines we select primitive breeds that are well adapted to the natural conditions that can be found in Lika Plains. Among horses this could be Huculs from Central Europe or the Bosnian mountain horses of which a first herd already grazes in another part of the Lika Plains. 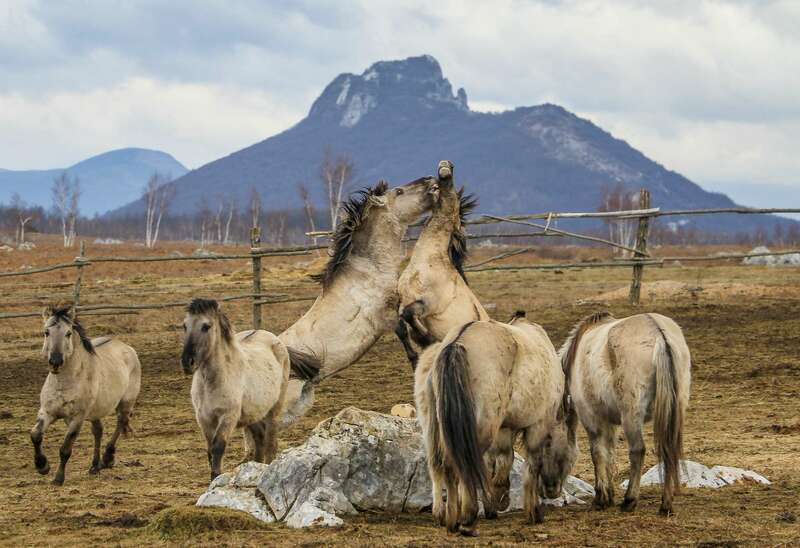 But also the Konik has proven to be a suitable breed for rewilding European horses. Jan van der Veen, coordinator of more than 20 konik projects in Latvia, has a lot of experience with this horse type: “More than 25 years of de-domestication under harsh conditions in Poland, the Netherlands and Latvia has formed a horse type that could add valuable characteristics in rewilding programmes of horses elsewhere in Central and South-Eastern Europe. They know how to survive in areas with heavy snowfall and wolves around”. 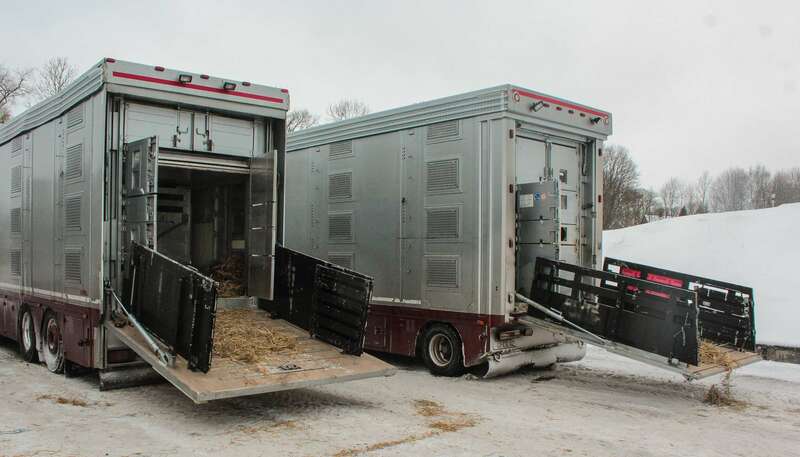 On the 12th of January, Jan and the local team of the Dviete Nature Park in Latvia selected social groups of total 45 horses out of the herd of more than 130 Konik. 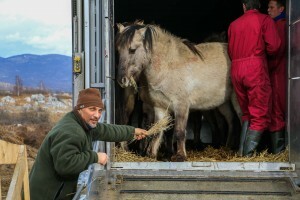 “During winter we can catch the horses much easier, because we can attract them with food, which in summer is almost impossible,” says Jan.
With a specialised transport company the horses travelled across Central Europe to arrive in Lika Plains on the 14 January around noon, only a few hours before a blizzard started scourging the area and its new inhabitants. 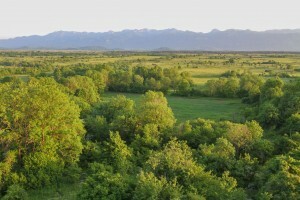 Together with Rewilding Velebit, the local landowners and land-users, Rewilding Europe will scale up its activities in the Lika Plains by connecting new grazing areas to the existing pilot during the coming years. 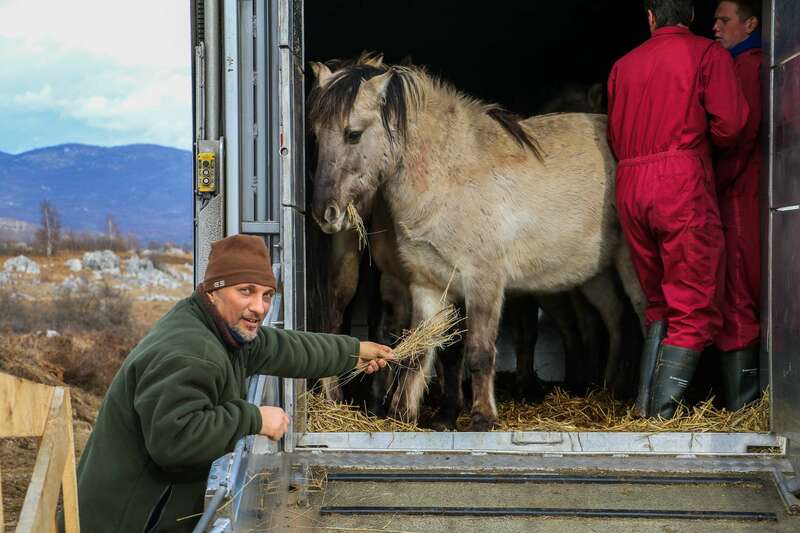 In the long term we will explore the connectivity of the Velebit Mountains and the Lika Plains for seasonal migration of wildlife as one of the first of its kind in Europe. Do you want to support the return of wild horses in our rewilding areas? That would be fantastic, please have a look at our donation page.